Elin Jean has always known she was different from others on her remote island home. She loves the seals that live in the waters surrounding the island and abhors the annual tradition of killing seal babies to thin the population. And if that isn’t enough to set her apart, her hands—with their thin webs connecting each finger— have marked her as a freak. Someone to be avoided. Elin Jean’s parents have never been open with her about why she is so different, and why she must stay away from the other islanders. But it’s just a matter of time before she discovers the truth about her past and the mysterious circumstances of her birth. And when she does, she will face a choice, as the child of a most unusual union. Partly of the land, partly of the sea, she must search both worlds and dig deep inside herself to find out where she belongs, and where her future lies. 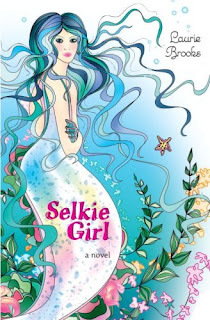 While Selkie Girl did have a very original premise, and I was excited to read it at first, unfortunately it didn’t live up to my expectation of it. I wanted to like it, but I just found it dull and lagging. The plot, to me, felt like it never went anywhere, and even though the writing was vivid and beautifully descriptive, the story itself fell flat. There were many scenes that I felt dragged the story down. The mythology of the selkies was my favorite part of the novel, and what made it slightly interesting to read. Even though I didn’t feel a connection with the characters, I could relate the Elin Jean’s desire to join the sea, to be who, or what, she really is. I’m a creature of the sea, so anything that has to do with the sea instantly attracts me. Mermaids, selkies, sirens, ect. Laurie Brook’s writing was wonderful, the scenery lush and so real. Neither of these two things were the problem. It was simply the plot. I feel that if something had been added to the plot to spice it up and create more suspense, I would have loved this book. But even with an interesting premise, great writing, and a solid mythology behind it, I couldn’t enjoy this novel. On a slightly more positive note, the cover is very beautiful. It’s what initially drew me to the book, and I do love the cover. I just wish that the book had been better. I’m sorry that this review is so short, but I don’t want to ramble on and on about something I didn’t like. I give this novel 2 out of 5 stars. The Tail of Emily Windsnap was a cute story. You might like that better if you like mermaids. It's a solid Mid-Grade novel.